I think at some point in the past, I may have admitted to being a chocoholic. After dropping the kids off at daycare, one of the lovely ladies basically shoved this chocolate bar at me, all the while exclaiming how good it is. I like my chocolate smooth, finely textured and usually a milk chocolate over dark chocolate. Sometimes I like additions, fruit, hazelnuts, or caramel. I'm not fond of almonds in my chocolate. Ever. I'm a bit skeptical of new brands. They are sometimes horrible. I've had some that are really gritty from the cocoa nibs, some that are just unpalatable because they are blended in such a way, well I think you understand. This bar was appealing to me for two reasons. First, it contains blueberries. I love blueberries. Blueberries dipped in chocolate are very tasty. Second, I had someone tell me it was good, so I wasn't completely out there braving the unknown. My verdict is YUM. I know, I know, lavender sounds weird, but somehow it works. 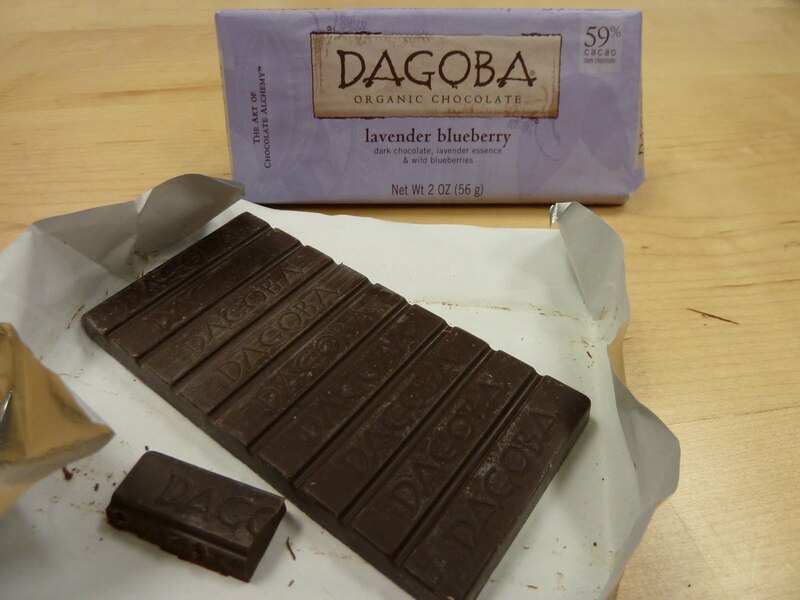 There is only the hint of lavender as you bite in, (just try to let in melt in your mouth), chew up the tiny bits of blueberry, and then there is a flowery aftertaste. The general texture is smooth, but not creamy like milk chocolate. It has that dryness like other dark chocolates. You can find the manufacturer's site here. I see they have other interesting flavors like Roseberry, Chai, and Hazelnut and items for baking. I see great possibilities for this. I have a fabulous brownie recipe that could really benefit from some awesome cocoa powder. Ah, hello, my darling chocolate friend!